I was recently wondering whether competitors in the 24 Hours of Le Mans 2015 would receive larger prizes on the whole than those awarded to competitors in the early 70s. 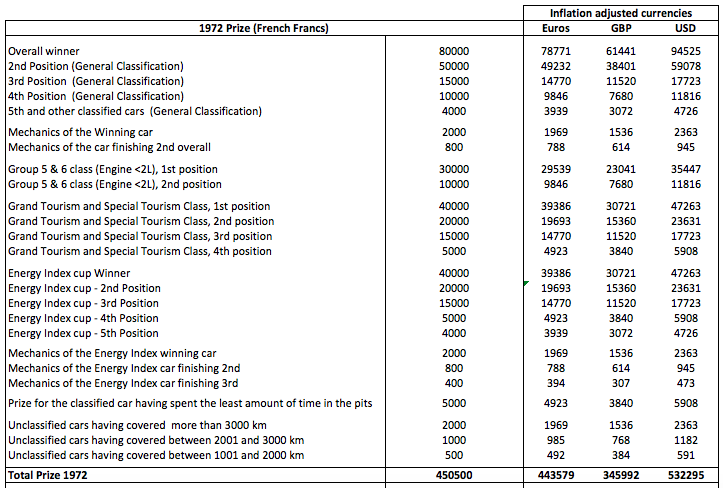 A fellow 24 Hours of Le Mans fan was kind enough to share with me the prize scale (in French Francs) from 1972. I then adjusted it by some 42 years of inflation and converted it back to Euros/British Pounds/US Dollars. Here are the results: the prizes awarded in 1972 were not, in total, so different from those awarded today (15% gap). 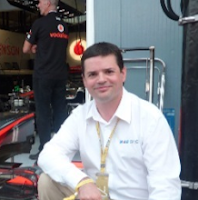 However, the way they were calculated and what each car was awarded individually were very different (notice the prize awarded to mechanics, the prize for non-finishing cars, etc...).